The LC-8120/8220 is the GPS-based speedometers which measure speed and distance of moving objects with high accuracy. Support for GLONASS satellite which is not supported in the conventional model (LC-8100A/8200A) to ensure stable measurement. Antenna for LC-8220 (LC-0721) is smaller and lighter than the conventional antenna for LC-8200A (LC-0086) and it enables easy operation. The new antenna (LC-0721) is able to attach to the conventional unit of LC-8200(A) for measurement. 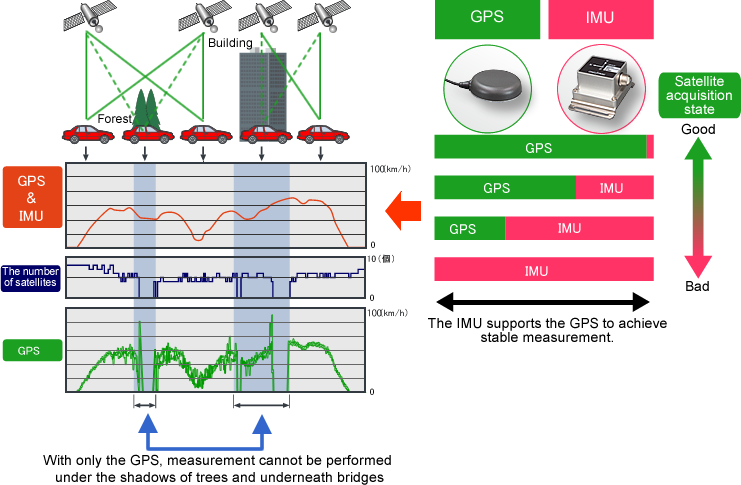 The linearity of acceleration and angular speed are improved by using the standard IMU (inertial measurement unit) together with the optional high accuracy IMU. Also, by adding the high response IMU analog output function (option), the analog output frequency of the IMU data can be increased from 100 Hz to 500 Hz. 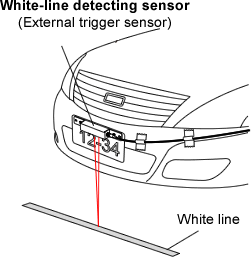 A wide range of optional functions such as white-line detecting function (LC-0856), jerk measurement function (LC-0871) and average deceleration speed calculation (function in the LC-0831) are available for various automotive tests. Small and thin antenna does not affect on the travel resistant measurement or car behavior measurement even if it is attached to the roof of the vehicle. Analog output frequency is able to be changed from 100Hz to 500Hz by high response IMU analog output function (option). Can be added new options of white-line detecting function, jerk measurement function and average deceleration speed calculation. If a satellite is lost, it can be recognized with LED and buzzer. 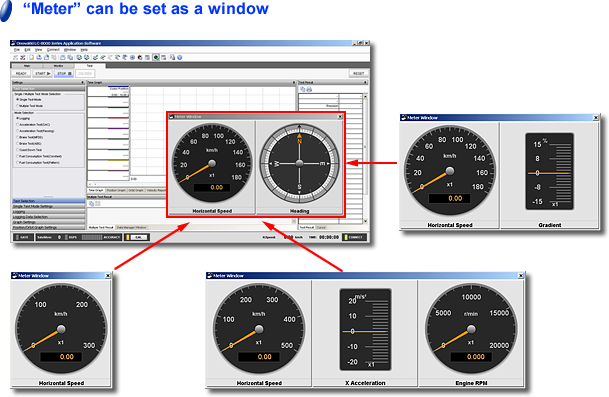 Various optional vehicle tests by software; acceleration/deceleration test, etc. 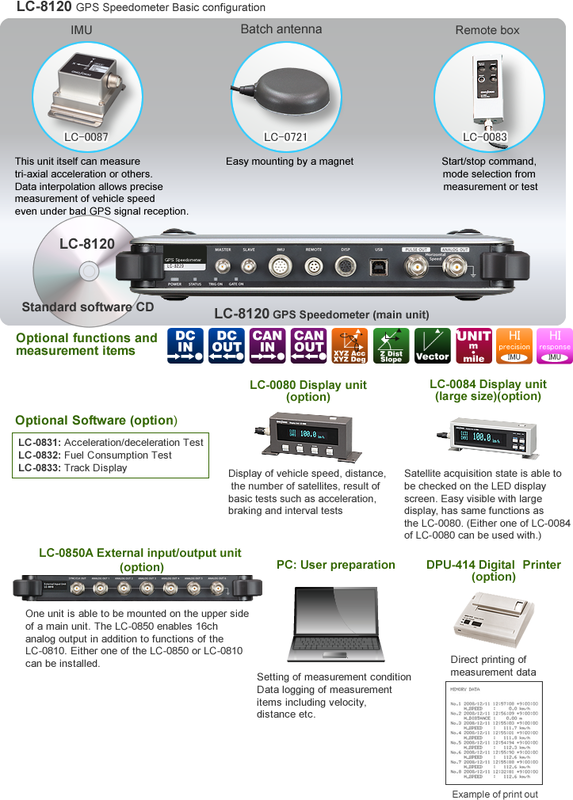 LC-8120 can be upgraded to the LC-8220 by adding several options. By the use of the Doppler effect of mobile object and carrier wave transmitted from the satellites, the LC-8000 series enable highly accurate calculation of the mobile object speed as well as longitude and latitude measurement. 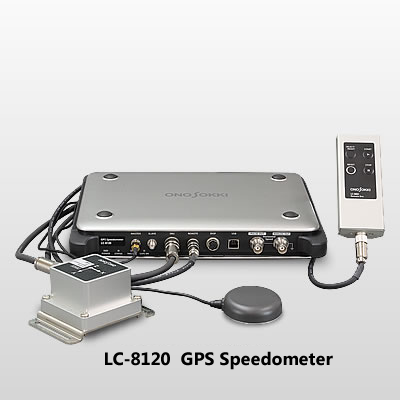 Using IMU, the LC-8000 series enable stable measurement which is not affected by its satellite acquisition state. Input at D-sub connector on a rear panel of LC-8220. Provided with 8-ch of analog input and more than 5-ch of pulse signal input. Data logging is enabled by a PC. Input voltage range is 0 to ±10V, 0 to ±20V. *LC-0850A (external I/O unit is required) for the LC-8120. . This function enables output of measuring data at the main unit as analog voltage. Output voltage is 10 V max. Up to 16 channels are able to be selected for data output. Analog output function of speed is provided as standard. 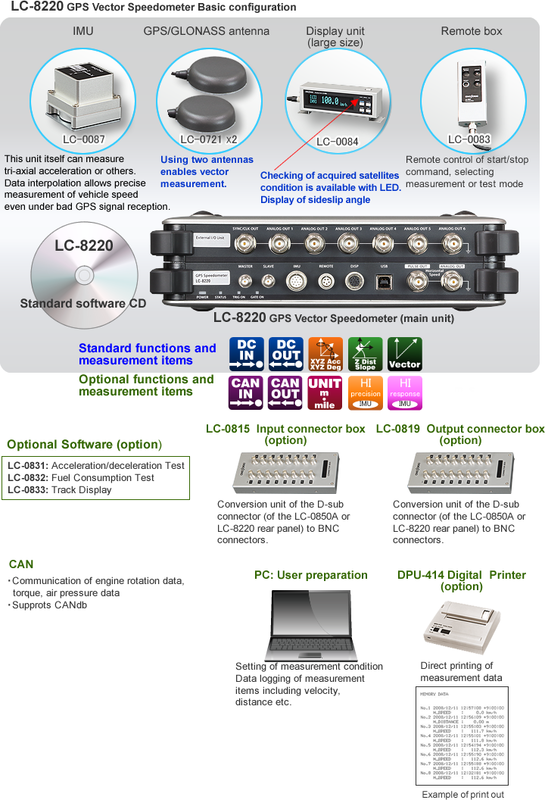 *LC-0850A (external I/O unit is required) for the LC-8120. Acquisition of CAN data. Compliant with CAN ver. 2.0B, up to 32-ch. *Requires LC-0851 (option; CAN input function) for both LC-8120 and LC-8220. Output of measuring data in a main unit via CAN communication. The output update rate is every 10 ms. Compliant with CAN ver. 2.0B. Specified ID contents can be output as CANdb format. Measurement of acceleration, angular speed, and angle in XYZ axes of IMU. *Requires LC-0821 (option; IMU data output function) for LC-8120. Vertical direction is able to be measured by height data acquired using GPS, Z-axis data acquired using IMU. Thereby, slope can also be measured. 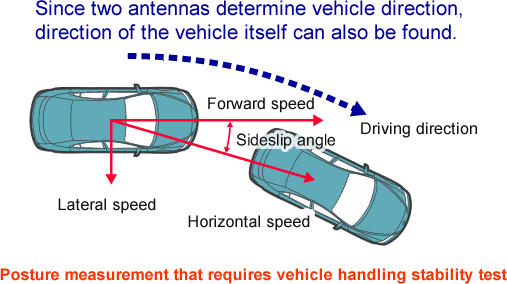 Since two antennas determine vehicle direction, direction of the vehicle itself can also be found. *Requires LC-0823 (Vector measurement function) for LC-8120. 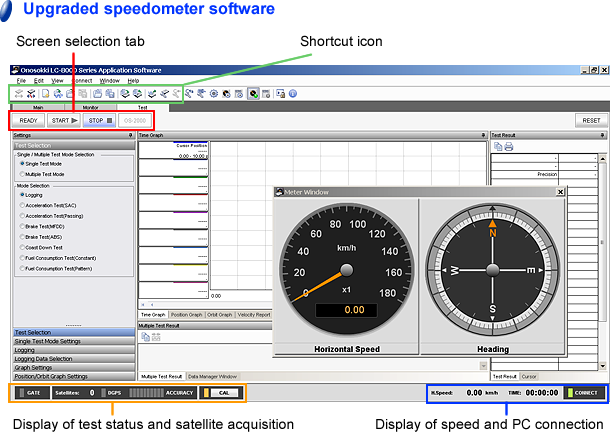 The measurement unit is able to be selected, Km or Mile in a setting screen. *Requires LC-0820 (Unit switch function) for both LC-8120 and LC-8220. This IMU can measure the linearity of angular speed with high accuracy (±0.03% /F.S. or less). High response measurement is possible with output frequency of 500Hz. (Standard IMU: 100Hz of output frequency)　LC-0870 (High response IMU (option)) is required for the LC-8120/8220. 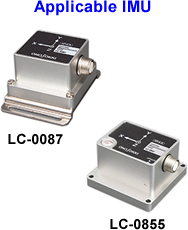 Both IMU (LC-0087) standard accessory for LC-8120/8220 and optional high precision IMU (LC-0855) can be used. ●　One item of data is created with the Ready → Start → Stop measurement sequence. Management of the data generated is important in tests that often repeat the measurement sequence (Ready → Start → Stop) multiple times. 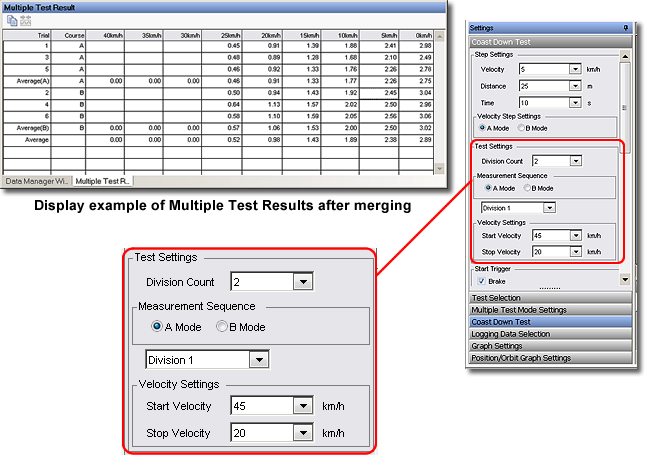 The multiple testing function manages the results of multiple tests with a data manager. 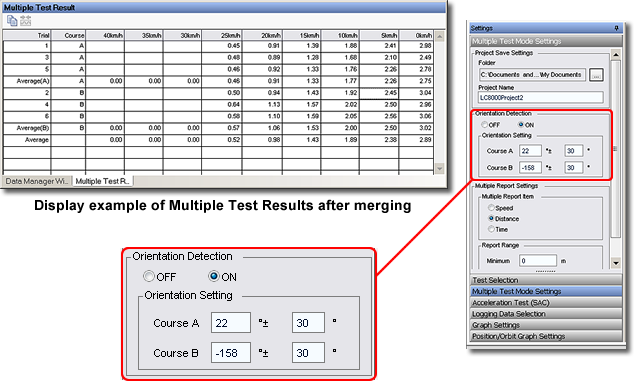 This allows differences in results for each test to be easily verified. 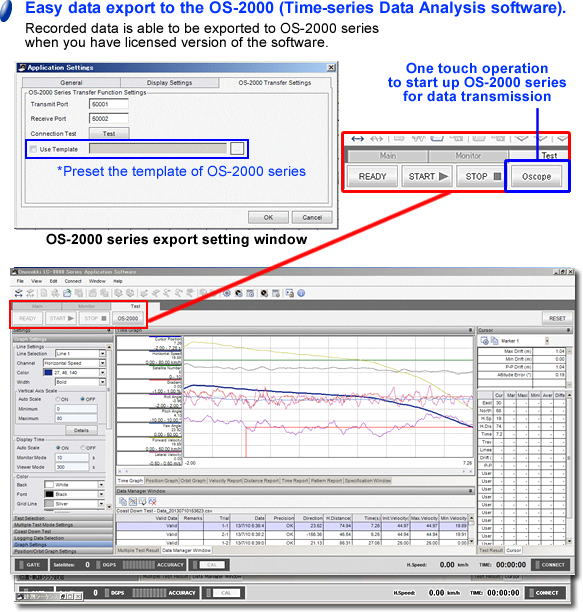 ● Easy setup of measurement and recording channel, CANdb format file can be read. ● CANdb file generation function makes it easy to use with CAN recording device. ● Used when reciprocal running tests are required. ● By setting the driving direction of the vehicle, recorded data is separated into course A and course B to manage results. ● Average values can be displayed for each course. ● A function available when coasting tests, multiple tests, and the direction cognition function are set. 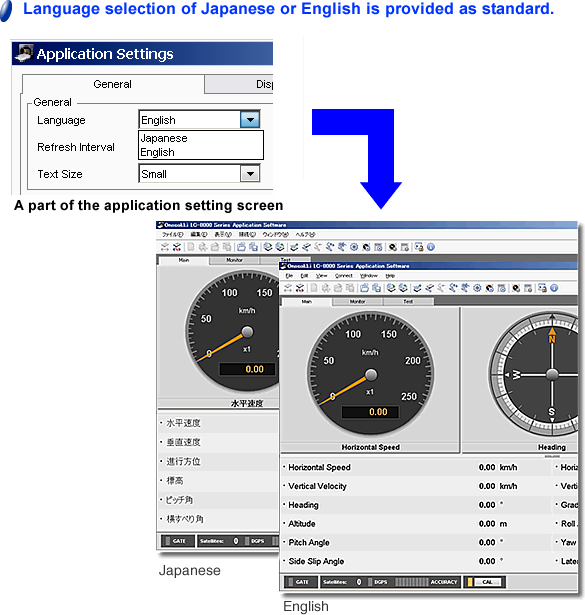 ● Test is started and finished automatically by setting the number of partitions and the test start velocity beforehand. ● Multiple recorded data are displayed together. 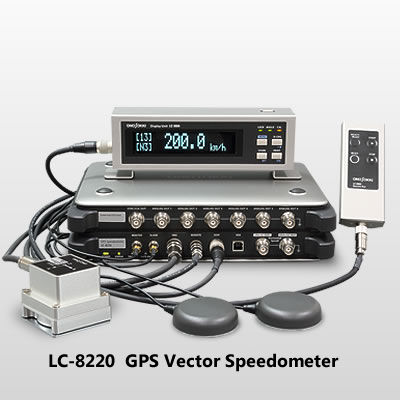 ● The LC-8220 or vector measurement function is required to obtain the driving direction. *5 Available with two or more antennas. Output accuracy ±0.2 % F.S. Item -(Available by LC-0850A) Selectable 16-ch from Horizontal speed, Forward speed, Lateral speed, Vertical speed, Number of satellites, Travel orientation, North speed, East speed, Sideslip angle, Yaw angle, Pitch angle, Roll angle, IMU coordinate axis XYZ acceleration. 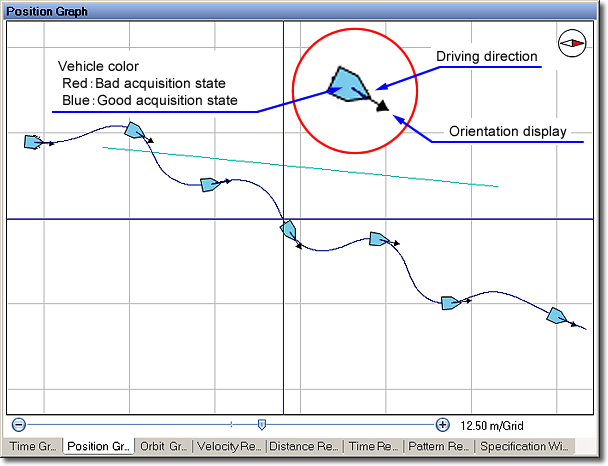 IMU coordinate axis XYZ angular speed, Slope angle, Satellite lost flag, Vehicle coordinate axis XYZ acceleration, Vehicle coordinate axis XYZ angular speed, Vehicle attitude angle, IMU coordinate axes XYZ jerk. ＊1:Accuracy at 30 km/h or higher horizontal speed and with 7 or more acquired satellites. ＊2:Accuracy over 300 m measurement distance with 30 km/h or more acquired satellites. 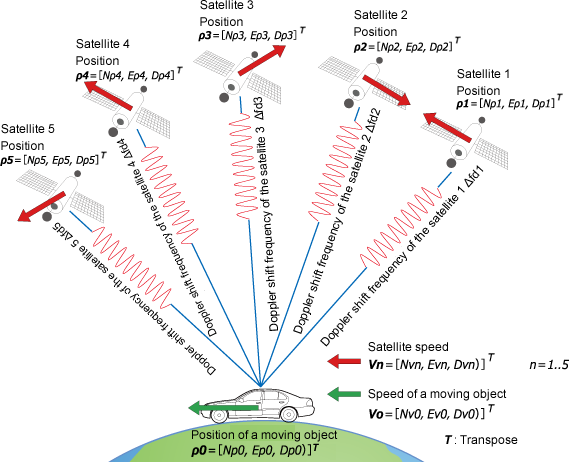 distance between antennas at 100 km/h horizontal speed and with 4 or more acquired satellites. ＊4:Accuracy with 2m distance between antennas at 100 km/h horizontal speed and with 7 or more acquired satellites. ±0.70 % with 2 m distance between antennas at 100 km/h horizontal speed and with 4 or more acquired satellites. ＊5:Accuracy with 2 m distance between antennas at 100 km/h horizontal speed and with 7 or more acquired satellites. ±0.20 m/s with 2 m distance between antennas at 100 km/h horizontal speed and with 4 or more acquired satellites. between antennas at 100 km/h horizontal speed and with 4 or more acquired satellites. ＊7:Accuracy with 2 m distance between antennas at 30 km/h or higher horizontal speed and with 7 or more acquired satellites. 0.30°RMS with 2 m distance between antennas and 30 km/h or higher horizontal speed and with 4 or more acquired satellites. between antennas and with 4 or more acquired satellites. 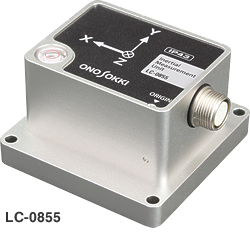 ＊9:Available when the LC-0855 High precision IMU (option) is attached. ＊10:Analog output is available when high response output option is attached. * Windows® 10、Windows® 7 are registered trademarks or trademarks of Microsoft Corporation in the United States and other countries. * Intel® Core is a registered trademark of Intel Corporation in the United States and other countries. Selectable16-ch from Horizontal speed, Forward speed, Lateral speed, Vertical speed, Number of satellites, Travel orientation, North speed, East speed, Sideslip angle, Yaw angle, Pitch angle, Roll angle, IMU coordinate axis XYZ acceleration, ＩＭＵ coordinate axis angular speed, Gradient, Satellite lost flag, Vehicle coordinate axis XYZ acceleration, Vehicle coordinate axis XYZ angular speed, Vehicle attitude angle, IMU coordinate axes XYZ jerk. CAN input:up to32 ch can be acquired. protocol is different, depending on the model (vehicle model) or engine model. Converts D-Sub input connector of an external input/output function unit to BNC. Converts D-Sub output connector of an external input/output function unit to BNC.